There's a reason pro bodybuilders love pre-exhaust training: Nothing demolishes muscle fibers quite like it! Consider yourself warned; every inch you gain from this workout comes with some pain! 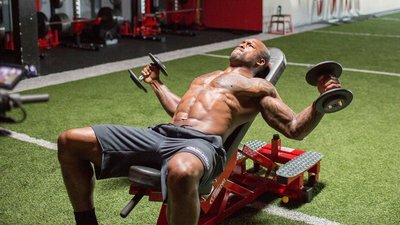 With this technique, you isolate your pecs with a single-joint move in which the triceps aren't actively engaged, like a fly variation or cable cross-over. With your chest fatigued from the isolation exercises, you then perform your multijoint moves with your triceps fresh, meaning they'll be less likely to give out before your pecs. This style of training is great for overcoming chest-growth plateaus. However, you'll still want to keep your reps on the higher end for single-joint movements so as to not overtax the joints.